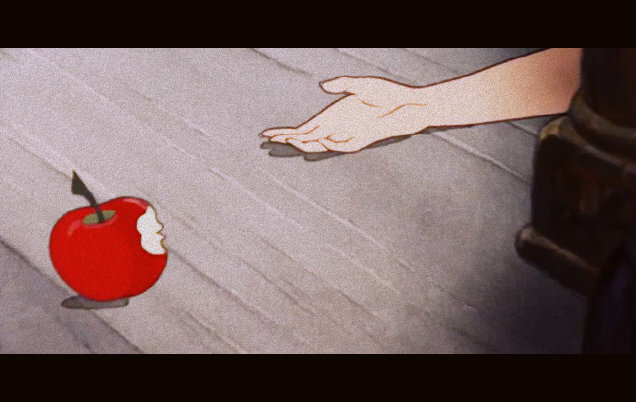 The apple. Such a powerful symbol, so ambiguous. Such a stylish way to make an exit. We forget that Snow White and the Seven Dwarfs was a huge sensation among adults when it premiered, and was taken surprisingly seriously. (An incomplete, but not completely off-the-mark, modern comparison might be to James Cameron’s Avatar.) Attending the first feature-length cartoon released for an adult audience would have been a tremendous escape in pre-war England; Turing attended in Cambridge in 1938, soon after he had gone to work at Bletchley Park. The film was a popular topic of conversation in England, both because of the media blitz and merchandising that accompanied the film and because of the considerable debate about the impact of the horror aspects of the film on children. The demise of the Queen is still as violent a scene as it ever was. Police-Sergeant Cottrell said he saw Dr Turing lying in bed with the clothes pulled up towards his chest. There was a white frothy liquid about the mouth with a faint smell of bitter almonds. On a table at the side of the bed was half an apple from which several bites had been taken. The witness said that in another room he found a cooking pan with a double container which was connected to electric wires. The contents of the pan were bubbling and there was a strong smell of bitter almonds. Posted by David Stutz on Tuesday, April 24, 2012, at 1:15 pm with permalink. Tagged apple, snowwhite, suicide, turing.